These bamboo incense caskets are great for holding burning incense sticks (and cones too... stay tuned for those! ), catching the ash produced from combustion. They are lined with a non-flammable cotton pad which you can place the stick on directly after igniting it, or better yet sprinkle some white rice ash on top of the pad and then place the ignited stick on top of that. You can determine the 'sweet spot' by pushing the stick into the ash pile, where the cherry remains alive but the combustion rate is staggered. This slows down the burn (i.e. longer burn time per stick) and also allows for an even cleaner experience with minimal aromatic interference from the makko binder. When you find that sweet spot, a burning stick will smell like straight agarwood on an electric heater. 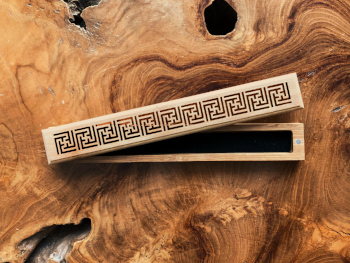 Unlike more typical incense holders, this model features magnets at both ends of the casket. This makes it much easier to open and close without making a mess, unlike other models where you have to align grooves around the edges to close or open the lid.